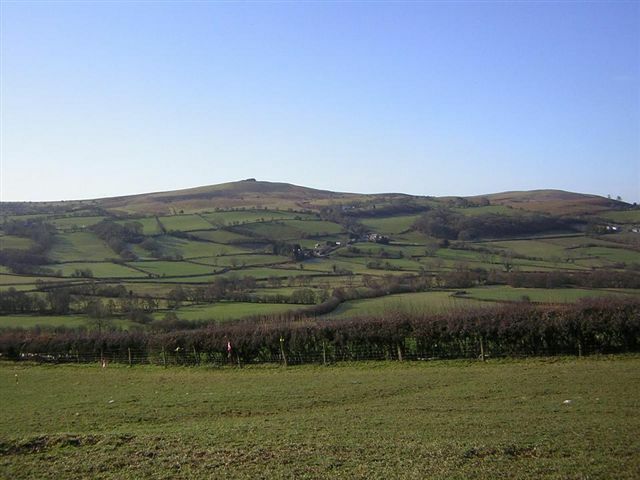 A few months ago I received a call from a lady who lives in Brecon. She explained to me that whilst she was cutting the lawn and trimming the overgrown borders with her son in law Simon and other members of the family, she learnt that Simon had lost his wedding ring. The ring was not expensive and didn't have any special design it was a simple gold wedding band, but the ring did have a sentimental value as it had once belonged to Simon's grandmother. On hearing the news that the ring was lost the family started looking frantically, going over the areas where Simon had worked and walked even emptying the sacks that they had filled with all the cuttings. But after many hours searching they decided that the ring was lost forever. However the owner of the property didn't want to give up and continued to search. After another disappointed search the lady of the house decided to look online to see if there was anyone who could help with the search, and in doing so came across my name on the Ring finders website and decided to give me a call. I was in work when the call came through on a Wednesday afternoon, the lady on the other end of the phone explained the whole scenario and asked if there was any chance that I would be able to help. I explained that I was working through the week and the only possible time I could search would be on the coming Saturday which she was happy with. In the meantime I thought that another detectorist/different machine would be of help in the search, so I contacted Mark and asked if he was available to help me search. He said that he was available on the Saturday, so we arranged to meet up and go looking for the ring. Saturday arrived and I called and collected Mark and we set off to Brecon!. After a 45 mile drive and having to call the lady to help us find the house, we finally arrived!! After introducing ourselves to a lady called Gladys we made our way to the rear garden, the house was a large detached house and the garden was larger than most but was kept in very good order. We asked her to re-enact the day that the ring was lost to get a idea of the area we would have to search. We were lucky that only a small section of the garden was used on the day the ring was lost. Mark and myself went back to my van and collected and assembled our detectors, then set about looking for the ring. Mark began looking through the flower beds and I began searching the lawn area, there was plenty of signals but we didn't dig any as we knew that the ring would be laying on the surface. I left Mark searching in the flower beds and I widened my search on the lawn, then half way between the house and the flower beds I got a signal. Looking down towards where the signal came from I could see the outline of a ring shape with the grass neatly surrounding it. I called Mark over to say that I found the ring and he strolled over to take a look, in the meantime I called Gladys from the house and told her that the search was over. I didn't pick up the ring I left it in situ until she came to the find spot, she asked me not to tell her where it was she wanted to see if she could see it. After about 15 seconds she finally spotted it amongst the grass and bent down to pick it up and looked relieved that the ring was found. Gladys was very grateful to us travelling all the way to Brecon and she couldn't wait to tell Simon that the ring was found. After bidding farewell to a happy Gladys, Mark and myself made our way home. 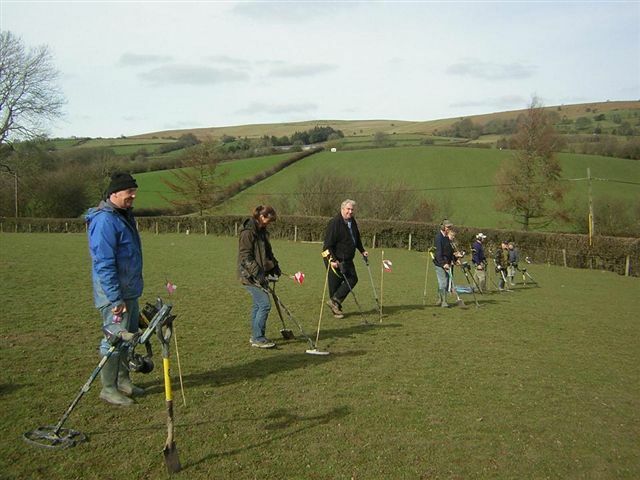 I volunteered , along with my detecting buddy George Jenkins, to take part in a metal detecting survey of a known battle-site. On the first day there were 16 volunteers, the second day there were 10. The aim of the survey was to try and find anything from the 1190's battle particular a “Bodkin Arrowhead” which could pierce chain mail or any other type of armour. We were searching in “all metal” and expected to dig all signals, which got very tedious after a while. 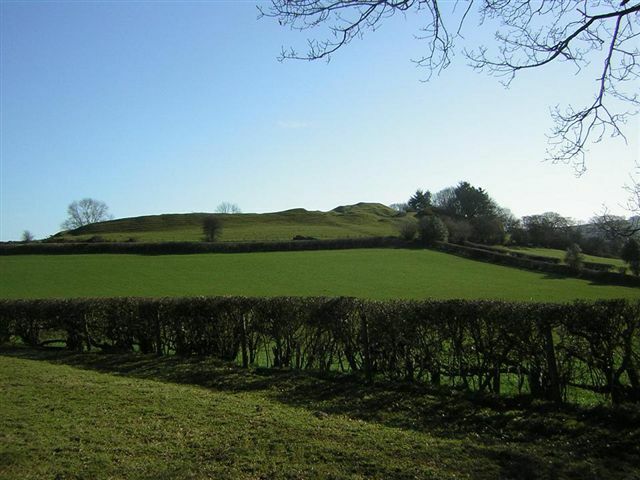 The area we were in was Painscastle, Powys, searching fields in the vicinity of the ruins of the castle. The scenery in that area was stunning and really hilly, the view from the castle back then must have been spectacular and any troops approaching could be seen from miles away. The search area had been set out by the two archaeologists in charge, there was a row of flags across the top of the field with a further row about 50 metres along the field and another the same distance away. We were told to pick a flag number and follow the corresponding flag across the whole field. We had been given small flags and plastic bags so any find would be bagged, left on the ground with a flag by it for the archaeologists to pick up and decide whether to keep it or dump it. It was a systematic search method, after we had completed a run down, and back up the field, the flags were re-positioned to be at ninety degrees to the first sweep. This way all the field was covered quite comprehensively. Lots of finds were uncovered, checked and logged on a GPS. After a break for lunch we made our way to a different field. The same method was employed and this field was covered fully too. The usual finds were surfacing, buttons, buckles, musket balls, lead etc, unfortunately nothing from the time they were hoping for. At around 4 o'clock we called it a day, hoping for better luck the next day. The next day we were in a field directly under the castle ruins, so hopes were running high. We picked our starting position by the flag that took out fancy and off we set, The outcome was much the same with nothing that was hoped for finding it's way to the surface. The flags were re-positioned about three times in this last field but to no avail, the same type of finds were coming to light. All the finds, regardless of what era they were from, were bagged and stored away for investigation back at the archaeologists' base. This was the first time I had experienced any work of this nature and it was very enjoyable. I would not hesitate to help out again if required as I think it fosters good relations with those who were considered “the enemy” not too long ago. I live in South Wales U.K. And I travel all over the country searching all the sites. I have permission to detect on with many great finds. 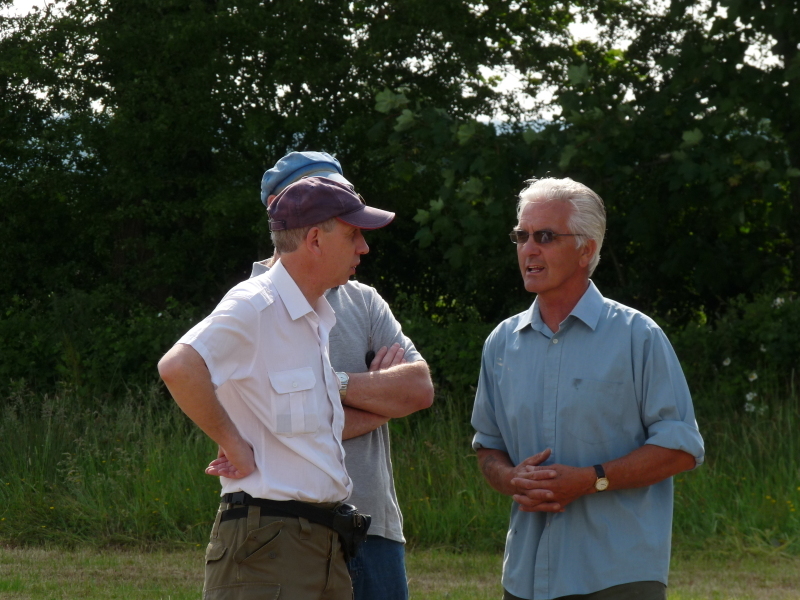 This one occasion, I was at a detecting rally in the south of England in a small Somerset village called Spaxton the villagers had organised a weekend event covering about 100 acres of historical land, with some of the land dating back to the bronze age. It was a warm day, and I had gone back to my van to have some lunch and chat and show off our finds we had found with plenty of roman and hammered coins, I was looking forward to the rest of the afternoon looking for more artefact's when a couple approached me asking me if I could help them locate a ring that had been lost a few years before. They told me that they was helping their neighbour to clear the overgrown back yard, when the gentleman who was helping them was clearing the brambles and needed a pair of gloves to handle them. He spotted a pair of gloves lying on the floor and went over to pick them up and unknown to him the lady whose yard he was helping to clear had taken off a gold ring and placed it on top of the gloves. He went over to the gloves and grabbed them not knowing that the ring was there, and in a flash the ring was sailing through the air into the undergrowth soon the whole group were looking for this ring and in the days that followed, they used all type of methods to find the ring even renting a metal detector but, still, with no luck. After they had told me the story behind the loss they asked if I would be willing to help them to find the ring, I was their last chance. He said that he has always felt guilt about loosing the ring even with reassurance from the owner that it was an accident he couldn't forgive himself. I picked up all my detecting equipment and got into his car and headed out to the area that the ring was lost and I thought to myself "this could be a long day". When I arrived at the property I was taken to the yard where the ring was lost and there we enacted the whole scenario and based on the details I went to the area where I thought the ring could have landed. In the years that the ring was lost the undergrowth had reclaimed the area where they had searched and I was looking at a lot of brambles and long grass. Like most of the detectorists in the U.K. I use a cut down spade, so with this cut down spade I began to hack away at the brambles and grass, and after a lot of sweat and profanities I managed to clear a small area, I thought then to give myself a break I will get my detector and search the area I had cleared. I switched on my machine put on my headphones and started to detect the area I had cleared, and within a minute I got a signal in amongst the dead leaves and hacked down foliage, I then used my foot to clear the area where the signal came from and there amongst the rubbish was this small yellow ring. 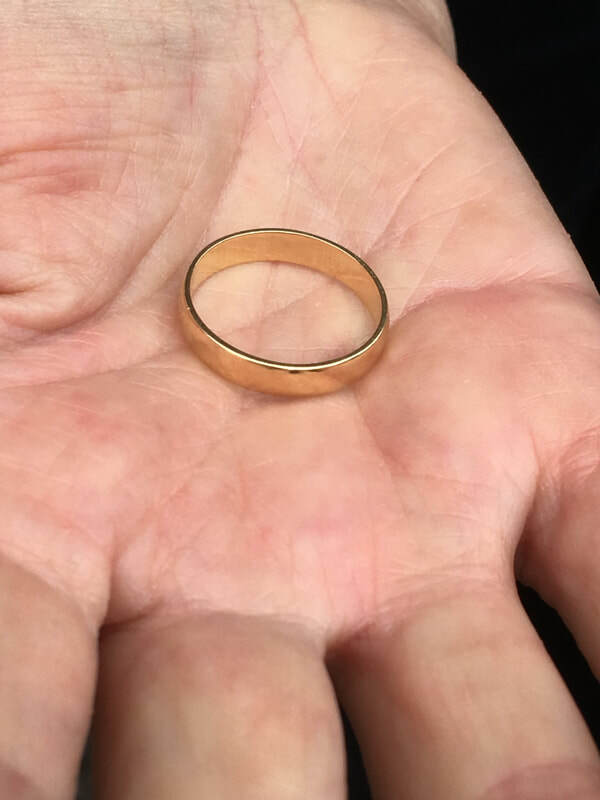 The gentleman was watching me working with my detector, I said to him "there it is" and with a look of disbelief on his face he looked down and saw the ring, I think for a few moments he stared at the ground not believing what he was looking at. He then bent down and picked up the ring and the realisation that the ring was now safe in his hand brought a large smile to his face and I think I heard a sigh of relief, as if he had been holding his breath since he accidentally lost the ring. I gathered up all my detecting stuff and headed back to the car, and all the time we walked back to the car he was constantly thanking me over and over and asking me what he owes me I told him "I didn't want anything as I was glad to find it", and I thought to myself that I still had time to search for the rest of the afternoon. I never got to meet the lady who owned the ring as she was on vacation and wouldn’t be home for a few days and I only had one more day at the rally. The gentleman insisted I give him my address as when the lady returned from the vacation she might want to get in touch with me. A week passed and a letter arrived in the post, the owner of the ring was overjoyed that the ring was found and that she was sorry that she couldn’t thank me in person but will be forever grateful. For me it was a rewarding experience, I had reunited the ring and owner and went on to find some more roman coins and a few nice ancient artefacts. It all started at a club meeting R.A.R.E. (Rhondda Artefacts & Research Enthusiasts) when I was asked by club members Tina and Dennis Pople, if I would show them around our club estate in the Vale of Glamorgan, which has been used by the club for the last 18 years. I was the obvious candidate to show them around because I have been a sort of unofficial liaison officer between the club and the estate for about 5 years and so have a reasonable amount of knowledge about our club ground. We have an exellent report with the estate owner and its personnel which was evident when we was approached a few years ago by the estate owner to organise a "Ragwort pull". It seemed that a valuable pedigree Bull had eaten some of the dreaded weed and as a result he died. The estate owner was so impressed that he contacted the "Western Mail" who published an article about it and to this day the estate is still relatively clear of the weed. My wife Ann and I met Tina and Dennis on a fine April day and a tour of the estate was duly completed. We then decided to spend the rest of the day detecting and after a picnic lunch and a long chat I took them to a pasture field, one of three about sixty acres, which hadn't been ploughed for many years but which had been detected on regularly. I had been on the field twice in the past,each time with a new members and each time I had found a pilgrim ampulla but attached no importance to it at the time. The other club members also found the odd artefact or modern coins but not enough to get exited about. Nothing much was found for the first hour or so except by Tina who had a silver love token near a tree, which I had detected around earlier. It was no surprise to me that Tina had found a love token because despite being relatively new to detecting her technique and dedication is an example is an example to us all and her records of finds is very impressive already!! I had by now parted company from the others who were out of sight and had been rewarded with a Victoria penny and a bronze pin, but getting rather hot and tired, I had a nice strong signal which my Explorer confirmed by the position of the cursor on the screen, and was quite pleased and surprised to find an Ampulla, which made one for each visit to the field. Having gained some experience over the years I made an ever-widening circle around the find and each signal produced yet another ampulla, until I had found four complete ampullae and five seperate pieces. It was by this time Early evening and time to get back to the car so for once I shut off the detector and walked quickly back eager to show my finds, which you can appreciate quite impressed my companions. Pilgrim ampullae are not exactly a rare finds but this amount in one area was a little unusual so later reflecting on the finds at home I decided to notify our FLO, Mark Lodwick and he advised me to rope off the area and record any more finds but that he was unable to visit us until a few days later. We returned to the site two days later and roped off 50 square metres. I reopened the previous holes and measured and photographed the finds in situ. Dennis meanwhile continued detecting in the roped off area and found another seven ampullae, which iI again photographed and during the course of the day I found another two. Tony Jones detecting outside the corden also found large fragments so we all had a rewarding day. The area by now was looking like an archaeololgical site, with each holes till unfilled, flags sticks denoting each find and because the site was quite isolated I decided to leave each ampulla in place with a name and number underneath (in retrospect a bit risky!!) and return the following day with some more club members. I also called at a nearby farm that would be aware of the activity (as we was in view of his farmhouse) to let him know that was going on. He was quite pleased that I had taken the trouble to inform him. We returned the following day, a Sunday and perfect for detecting. When we got to the site we were dismayed to see all the paper flags gone,but flag sticks still in place, and all the ampullae and paper numbers gone. A catastrophe!! "whos been here? who knew about it? " where only a couple of the numerous questions asked, but closer inspection revealedthe culprits-Woolly Welsh Sheep!! Each and ampullae had been pushed back into the holes and the paper flags and numbers had been eaten, our relief was evident and all was returned to normal within the hour. By Ann and our club chairman Paul Minton. We had lunch and departed to various parts of the field to try our luck having convinced ourselves that the hoard area had been thoroughly detected. However, still in our minds the number of people who had scanned the field over the years,but there was indeed more suprises to come. Tina once again started the ball rolling and i noticed her waving in the distance so walked quickly to her and others around her. She had found a silver hammered, the first of the day, we weren't sure what denomination but the Museum report later confirmed it to be an Edward I or II possibly an imitation but still a result. Paul was the next finder, using his "low and slow" mode with an Edward II penny, 1307-1327, so we were all exited wondering what else would come up. By this time we were really spread out and another two members had also arrived, Father and son team Mark and Stuart Street but I was again lucky enough to find an Elizabeth half groat 1558-1603.
we were of course wondering when it was all going to end. Tina then came into view and unbelievably she had yet another hammered, a second Elizabeth half groat. What an end to yet another exiting and fulfilling day!! Before leaving the field we filled all holes and removed the flags but marked the holes with numbered stones which certainly left the sheep somewhat bemused. Ann and I returned again two days later and spent the morning with Mark Lodwick who complimented all our efforts, all holes were GPS'd and recorded and one or two opened for Mark to examine the soil layering ect. Mark also remarked that to his knowledge this hoared was a first and in a historical context and was quite unique. 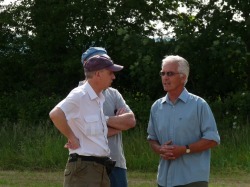 After he left we had another couple of hours detecting but the day was so hot that we gave up and returned home. Had the field given up its all....or was there more to come ? We visited the field the following week, myself, Tony Maz Tina and Dennis, this time tony found the first silver coin, a hallmarked silver strip and an unusual dimpled copper ball which we havnt been able to identify, part of a spoon,two other coins and more ampulla fragments. Once again my luck was in and a silver Edward I. When we returned home I made an approximate count of the number of hour sdetected which came to over 200 and was convinced that the field had been all detected out, by this time the words of a famous Jerry Lee Lewis song ' The News is out, all over town' and numerous visits by club members seemed to confirm his. Two weeks later John Williams, also an expert committed detectorist asked me in the club meeting how many hammered had the fields produced and I told him it was about seven in all, he said to make it 'nine' as he had found an Elizabeth 1 threepence 1558-1603and a Charles 1 shilling 1623-49. Another rough estimate of hours done on the field must now run to around 300. My last visit to the field was in November when I took yet another new club member Chris for a visit anticipating nothing but as ever hopefully expectant, I had warned Chris not to expect too much but he wanted to try out a new Garrett. I had a George V halfpenny, Chris found a Cartwheel penny and a army knife, a one pence coin and other odds and ends-so unbelievably finds were still surfacing ! Through research of the field has revealed no special significance, no footpaths, although the adjoining field has a footpath running through the centre from top to bottom though hardly anything has been found on this one, there is an ancient track running alongside the 'finds' field and there are ancient lead mines recorded in the area. None of the ampullae were completed so they were possibly made nearby and discarded as rejects. However another theory is that a trader, possibly with a view to recycle the ampullae, either lost them or was waylaid with a view to robbery and the ampullae probably thrown away,who knows ? It will probably remains a mystery forever. The other mystery, however is why the field produced so much, it is because detectors are getting more sophisticated and our detecting techniques improving or is it because the hoard find encouraged club members to go lower and slower which is a foolproof method of finding in sparse areas of ground. Of course a huge 'what else?' still remains. Ampullae were commonly distibuted at scared shrines or wells and are made in many patterns, many with identifying marks. The scallop-shell shape is an emblem of St James the Greater and was popular with pilgrims at the Spanish shrine Santiago de Compostella and most prevalent in the 14th and 15th. 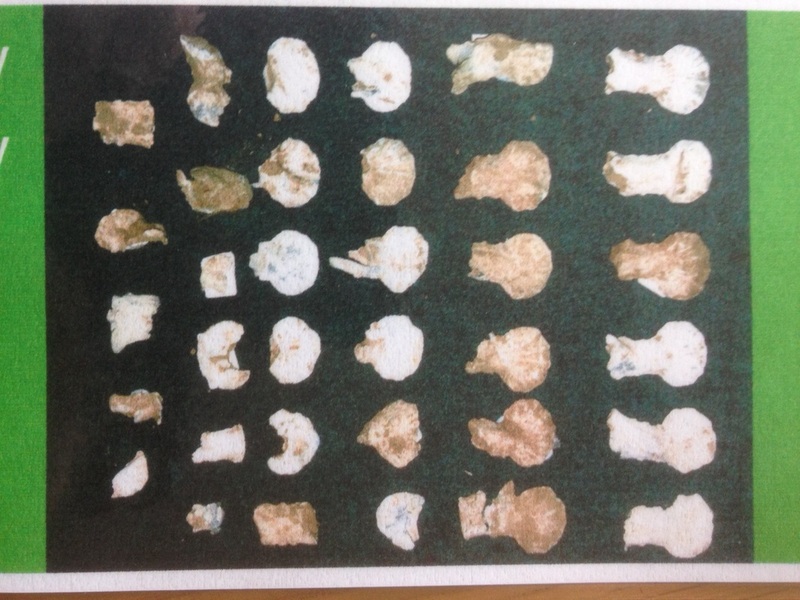 Original ampullae were made of lead, a mound with a large cavity is filled with molton lead and as the outside metal starts to freeze the still molton centre is poured out leaving a hollow shell, usually called the 'flush casting method' They were supplied either open for you to fill or sealed presumable costing more, for disposal later.